Germany’s finest: Dogs in blue (shoes) | Will My Dog Hate Me? Blame the Duesseldorf drunks — or thank them for their contribution to dog fashion. 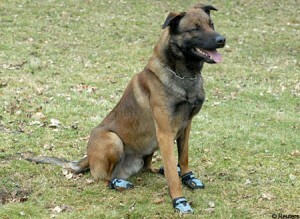 In February, 2008, 20 police dogs in Germany were fitted with blue booties to protect their feet from the glass shards left by revelers on the cobblestone streets of Duesseldorf’s old town. Most of the pups involved in the program were, naturally, German Shepherds, though some Belgian Shepherds were recruited too. Why blue? To match the human police uniforms, of course. 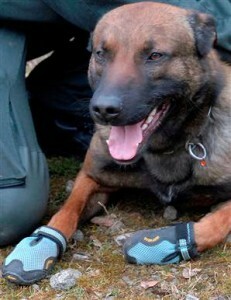 The dogs were given a month of training to get accustomed to their footwear. Were the Belgian Shepherds only included as part of a dog diversity program? If the dogs do a good job on patrol, might they get promoted to detective status? If so, would they go undercover and have to forgo the footwear? Actually, Siberian Huskies and other sled dogs do wear booties. At least when they are racing — all the Iditarod and Yukon Quest dogs have shoes to protect their feet from days of (sharp) ice and (cold) snow. I am assuming they are very, very macho booties. Ah yes, of course, Xtreme sportswear for Xtreme dog sports. I was picturing the huskies walking down the streets of Anchorage.